When trying to describe a sound in words, we always resort to its graphic synonym: high, low, short, long, thick, thin, dense, transparent, etc. This tendency becomes more apparent when one is illustrating sounds graphically. Standard notation in music is a graph of how sounds move in pitch and over time: staff, clef, measure, bars, tempo and so on. Even timbre  can be represented as a spectral pictur. Comparing the spectrum of a trombone with that of a flute reveals the difference between a dense sound and a transparent one. 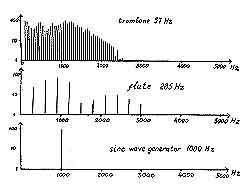 The most transparent sound is a pure tone, for its spectrum consists of only one line. The horizontal axis of this graph measures frequency in cycles; the vertical axis indicates the intensity in relative units. a flute and a pure tone. For the past 30 years, I have been working with the ANS synthesizer. This photoelectronic instrument takes its name from the initials of Russian composer Alexander Nikolayevich Scriabin, whose creative work and ideas about synthesizing the different arts inspired the young inventor Eugeny Murzin [2,3]. In 1938 Murzin invented a design for composers based on synthesizing complex musical sounds from a limited number of pure tones; this proposed system was to perform music without musicians or musical instruments. The technological basis of his invention was the method of photo-optic sound recording used in cinematography, which made it possible to obtain a visible image of a sound wave, as well as to realize the opposite goal - synthesizing a sound from an artificially drawn sound wave. Despite the apparent simplicity of his idea of reconstructing a sound from its visible image, the technical realization of the ANS as a musical instrument did not occur until 20 years later. Murzin was an engineer who worked in areas unrelated to music, and the development of the ANS synthesizer was a hobby and he had many problems realizing on a practical level. It was not until 1958 that Murzin was able to establish a laboratory and gather a group of engineers and musicians in order to design the ANS. I joined his laboratory in 1961 as asound engineer and composer. One of the main features of the ANS is its photo-optic generator, which Murzin designed in the form of a rotating glass disk with 144 optic phonograms of pure tones, or sound tracks. The narrow tracks that proceed from the wide track at the edge to the center of the disk correspond to the 144 pure tones. The track nearest to the center has the lowest frequency; the track nearest to the edge has the highest. A unit of five similar disks with different rotating speeds produces 720 pure tones, covering the whole range of audible frequencies. To select the needed tones, a coding field (the "score") was designed in the form of a glass plate covered with an opaque, nondrying black mastic. The score moves past a reading device made up of a narrow aperture with a number of photoelectric cells and amplifiers. Scraping off a part of the mastic at a specific point on the plate makes it possible for the light from the corresponding optic phonogram to penetrate into the reading device and be transformed into a sound. The narrow aperture reads the length of the scraped-off part of the mastic during its run and transforms it into a sound duration. The nondrying mastic allows for immediate correction of the resulting sounds: portions of the plate that generate superfluous sounds can be smeared over, and missing sounds can be added. The speed of the score can also be smoothly regulated, all the way to a full stop. All this makes it possible for the composer to work direcdy and materially with the production of sound. Thc exterior of the ANS synthesizer. Twenty bandpass amplifiers are on the left side of the main front panel. In the center of the synthesizer is a reading device (on the left) and the pitch scale and coder (on the right). The black board on the right side is the operating field, or the score. On the lower front panel are keys for controlling the 20 bandpass amplifiers and ajoystick for controlling the tempo. The ANS synthesizer, which I have been using for 30 years, contains 720 pure tones and an operating field with scales for pitch and duration. This number of pure tones makes it possible to obtain a high density of synthesized sound and a smooth variance of pitch. The minimum interval is 1/72 of an octave, or 1/6 of a semitone, which is only just perceptible to the ear. Such a precise gradation of the pitch makes it possible to synthesize a greater number of sounds per octave than the traditional Western musical scale's 12 semitones. Thus, for example, one could use a scale with 24 quarter-tones such as the Indian Sruti scale. The timbre can be made variable in time and can be transformed into a completely different timbre or noise - even into white noise containing all 720 pure tones. The most curious properties of this synthesizer are its graphic method of coding sounds on the operating field, or score and the possibility of hearing the result immediately. For traditional composing, the operating field has a pitch scale similar to a piano keyboard, with a special coder for setting pitch, duration, volume and timbre. To obtain a more precise coding of the pitch, every semitone on the pitch scale can be divided into six parts. (4) reading device and (5) mechanical drive. I began experimenting with the ANS synthesizer when I joined Murzin's laboratory in 1961. The most attractive method of composing for me was the freehand drawing of graphic structures on the score, including random and regulated elements, which are also transformed into sounds, noises and complex phonations. This offers new possibilities for composing, especially using variable tempo and volume. 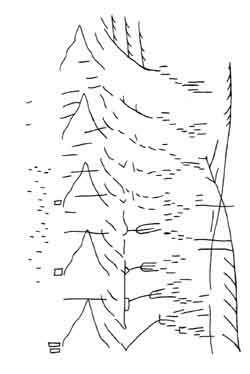 Figure shows a drawing I made on an ANS score. The score is read from left to right: marks that are aligned vertically represent sounds that are heard simultaneously. The short horizontal lines on the left side represent double sounds and chords of pure tones. The four rectangles that come next represent a chord of narrow-band noises; the five lines that rise and fall in the form of angles represent a complex tone consisting of five harmonics played glissando. Concurrent with the harmonics is a chord whose changing components are traced in the form of horizontal and sloping lines. This chord increasingly gains in complexity, falling in tone and gathering new sounds and noises (represented by the vertical lines). The pitch and duration of the components of the score are random, but their place and role in the whole composition is calculated. The only regulated elements in this fragment are the five harmonics of the complex tone. freehand on the mastic-covered plate. In 1961 I composed the music for the film Into Space. Artist Andrew Sokolov's cosmic paintings appeared as moving images in the film, smoothly changing into each other and dissolving into fragments by means of cinematic devices. The light and color of Sokolov's cosmic landscapes generated complex phonations and sound transitions in my mind. The movement of the cosmic objects on the screen initiated the rhythms of my music. I tried to express all this by tracing it on the ANS's score, making corrections after listening to the resultant sounds in order to gradually obtain the suitable phonation. I finally felt that the sounds produced by the ANS synthesizer on the basis of my freehand graphic structures correlated perfectly with the pictures on the screen. All of these were composed traditionally for orchestra previous to my work with the ANS. When I coded these orchestra scores on the ANS, I wanted to solve the problem of animating electronic sounds, so that the phonation of the ANS could approach that of the orchestra. These pieces appeared on a recording entitled ANS, which was produced in 1970 by MELODY. Later I used the ANS to help me compose the music for a puppet show that incorporated the use of light  called Fire of Hope, which was based on Pablo Picasso's works. The play was performed in 1985 at a festival in Moscow and in 1987 at a festival in Kazan by the Moscow group Puppet Pantomime, under the artistic direction of Marta Tsifrinovich. My composition Variations, written for the ANS, was also performed during the 1987 Kazan festival. In 1991, I began working on the music for the slide composition Rarschach Rhapsody by P.K.Hoenich, who is known for his light pictures created with sunrays . The composition consisted of 40 sun projections with abstract and half-abstract forms. Rorschach Rhapsody was performed at the symposium of the International Society for Polyaesthetic Education in September 1992 in Mittersill, Austria. In 1993, I collaborated with Valentina Vassilieva to compose a suite of 12 pieces entitled The Signs of the Zodiac. These compositions used the ANS along with the sounds of voices, natural noises and musical instrumentation. I am currently working on a fantastic piece named "An Unexpected Visit," for ANS synthesizer, transformed natural noises and percussion instruments. Schnittke experimented with the ANS from 1968-1970. The resultant compositions - Denisov's "The Singing of the Birds," Gubajdullina's "Vivente-nonvivente" and Schnittke's "The Stream"- were recorded and have been released . The ANS remains a unique apparatus available to only a limited circle of musicians: the single experimental model of the device in existence currently belongs to Moscow State University, where a general lack of space and technical support have prevented a widening of the circle of ANS users. Although the ANS has not achieved widespread fame, the idea of directly transforming graphic structures into sound structures has not lost its relevance and can now be used successfully in computer music. 1. See E. Skudrzyk, Die Grundlagen der Akustik (Vienna: Springer-Verlag, 1954). 2. See G. Anfilov, Physics and Music (Moscow: Detgiz, 1962). 3. See "Musica electronica tutto di il mondo," La Stampa, 14June 1968. 4. For more information on this kind of performance, see Bulat M. Galeyev, "Musical-Kinetic Art in the USSR," Leonardo, No. 1, 41-47 (1991). 5. Editor's Note: P.K. Hoenich has published several articles in Leonardo, including "Light Symphony,No. 1: A Kinetic Pictorial Artwork with Light," Leonardo 14 (1981) and "Sun Art: Kinetic and Static Pictures Created with Sunrays," Leonardo 19 (1986). 6. The three recordings are included on a compact disc entitled Musical Offering, which was produced by MELODY in 1990.